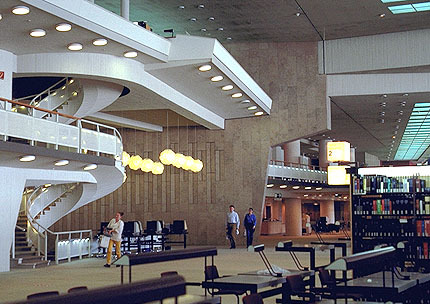 The Staatsbibliothek forms the eastern boundary of the Kulturforum, a complex of buildings which also includes Scharouns Philharmonie and Kammermusiksaal and Mies van der Rohes Neue Nationalgalerie. The building exhibits an architectural language familiar from Scharouns Philharmonie (completed in 1963), but pleasingly and appropriately adapted to the program of a library. 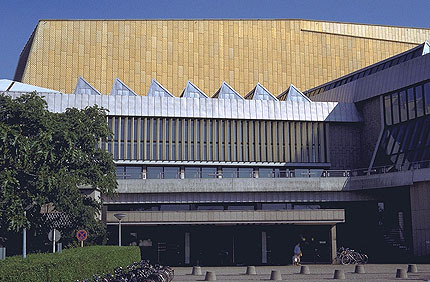 If the Philharmonies sculptural interior (generated by the concert hall itself) stretches and compresses its exterior, the Staatsbibliotheks multiple reading, research and stack spaces make for a gentler, and less agitated exterior. The spaces within are wonderfully modulated. The volumes of reading rooms, offices, and stacks are seemingly stitched together by stairways and smaller changes in level. The building beckons to be explored. Along with the Exeter Library designed by Louis Kahn, the Staatsbibliothek is probably the most famous of modern libraries. 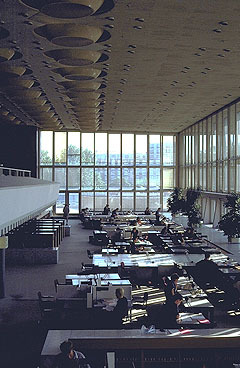 Its contribution to architects understanding of a building type with a long and well-documented history has been extremely influential in subsequent library design. Scharouns building, while deriving its form from its function, is no mere sum of functional parts. Its expressivenessand that of Scharouns other buildings in the Kulturforumis personal and idiosyncratic in ways that mark a clear contrast to the canonical international style exhibited by its neighbor, Mies van der Rohes Neue Nationalgalerie (1965-68). The Staatsbibliothek is south of the Tiergarten and west of Potsdamer Platz.